Please Note: The stills used here are taken from the DVD copy included in the package, not the Blu-ray edition under review. On Thanksgiving, right after dinner, two little girls leave one girl's house to go up the street to the other's house. Ironically enough, as it turns out, it's to look for the second girl, Anna's, emergency whistle, given to her by her father in case she ever gets in trouble. Anna never uses it that day. She and Zoe never return home. Also missing is the RV that had been parked down the road in front of the empty house. It appears that Anna and Zoe have been abducted. And so Prisoners hits the ground running. The movie, written by Aaron Guzikowski (Contraband) and Denis Villeneuve (whose overwrought and at times ridiculous Incendies was a critical hit back in 2010), is the story of two families caught in a horror they never imagined, one that extends beyond their respective clans and touches on old tragedies and pain in their community. The recurring cycle of abuse leads to further abuses, and woven into the knotted narrative, ethical questions prompting audience members to ponder what they might do if faced with similar choices. Hugh Jackman leads the cast as Keller Dover, Anna's father. Hustle & Flow's Terrence Howard is Franklin Birch, Zoe's dad. Maria Bello (History of Violence) and Viola Davis (Doubt) are the girls' mothers. The panicked parents call the police immediately, and their case is assigned to Detective Loki (Jake Gyllenhaal, Brokeback Mountain), a dedicated officer with a stellar track record. The RV is spotted not far away, and when the police convene on it, the driver tries to flee and crashes. Alex (Paul Dano, There Will Be Blood) is mentally challenged, and Loki isn't convinced he's smart enough to even be capable of such a crime. Plus, his camper is clean, there is no evidence the girls were ever there. The police can't hold the boy. It's that last plot point there that is the real crux of Prisoners. Believing that the police aren't doing enough, Keller kidnaps Alex and locks him in an abandoned apartment, where he tortures him in hopes he will confess to the abduction, making the Birches accomplices in the process. Meanwhile, Loki carries on pursuing divergent and parallel leads, digging up a secret history of crimes in the area and unearthing other suspects. 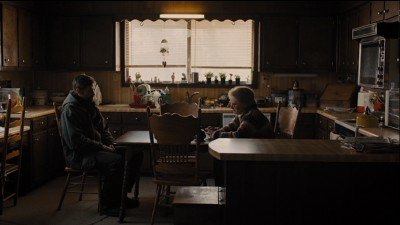 Also, Alex's aunt (Melissa Leo, The Fighter) is left to wonder where the boy she raised has gotten to, one of many difficult consequences of Keller's actions. If he's wrong, has he not just put another parent through the same hell he is in? That's one of the smaller questions Prisoners brings up. There are quite a few moral hypotheticals inherent to what is happening. Prisoners is a philosophically challenging motion picture. The filmmakers work the narrative on both a personal level (what would you do as an individual?) and an even larger one (what do we do as a people?). While neither Guzikowski nor Villeneuve ever tie what is happening to the Dovers and the Birches to any national condition--the film is never given any backdrop, there are no cuts to newscasts referencing the War on Terror or really any indication of a timeframe given--the allegorical aspects are nigh unavoidable. Do the ends justify the means? Is one life tradable for another? Is our own sense of justice malleable, and is it worth being wrong on the off chance you're right? Why this works so well, again, is because there is nothing pointing the viewer in any particular direction. This is not necessarily our world we're looking at, but an abstraction. The characters in Prisoners live in an isolated gray space--both in a moral sense and a physical sense. Cinematographer Roger Deakins (Skyfall, No Country for Old Men) takes full advantage of the fall weather. Clouds, rain, and snow mean dark skies and chilled air. The whole film has a foggy haze over it. There are many ways in which the characters in the movie are prisoners, including being trapped by circumstance and environment. Johann Johannsson's moody score only adds to the dismal pallor. Prisoners definitely required strong leads, especially when it comes to selling some of the later plot twists. Jackman and Gyllenhaal are powerful together, giving complementary performances that establish the movie's most important dynamic. The father is all righteous anger, while the cop is burdened by a weary pragmatism. The potential for failure dogs them both. Gyllenhaal is the bigger surprise here, giving an assured performance that makes Loki somewhat of a distant cousin to his soldier in Jarhead. His portrayal of the officer is mature and deliberate, valuing smarts over technique, keeping the method-acting tics to a subtle minimum. For some, the length of Prisoners (2 1/2 hours) will be troublesome, especially given how bleak the movie is. Some also won't like the uncomfortable territory that the film leads its audience into. Others may not like the deceptively easy answers the final act offers, or could even argue over what the movie could be seen as justifying. Those who commit to the movie, though, will find much to take away from it. Prisoners gives back as much as it asks for. The film is mastered in 1080p at a 1.85:1 aspect ratio. Image quality is fantastic, with sharp resolution and deep detail. For a movie as dark as this, the blacks are essential, and the studio does right by Deakins' photography, making for a good balance between light and dark but also really deep shadows and pitch-black fades. Color looks natural overall, and the surface grain is handled with cinematic finesse. The main audio track is DTS-HD 5.1, and the mixers work capably with all the speakers, creating a true surround-sound atmosphere. Dialogue is crisp, and effects and music work well to establish the expected ambience. English and French dubs are also available in 5.1 (the French was recorded in Quebec), and there are subtitles in both languages, alongside an English SDH option. Prisoners is a dual-release set, with both a DVD and a Blu-ray in a regular-sized case. It also comes with a code for a digital download via the questionable Ultraviolet platform. The physical package has an outer slipcover. The disc has two bonus features, a documentary called "Every Moment Matters," focusing directly on the relationship between Jackman and Gyllenhaal's characters, and "Powerful Performances," a short look at the whole cast. The first is only 3 minutes long, while the second is 9 minutes long. Highly Recommended. Prisoners is a challenging, complex thriller fueled by intriguing ideas, moral consequences, and a strong ensemble cast. Lives intersect when two little girls go missing during the holidays, leaving two families to grieve and luring one cop into a deeper mystery than he bargained for. Characters are faced with hard choices, and viewers are challenged alongside them to question what they might decide if the same circumstances were to arise. It's not always an easy movie, but the tight plot construction and strong direction make the commitment worthwhile.